Patience Morley has only been married for a few months and she is thrilled to be pregnant with her first child in November of 1662. One cold morning, she goes outside in search of her husband. Her chance encounter with a turkey becomes a story that will live in family lore for generations to come. 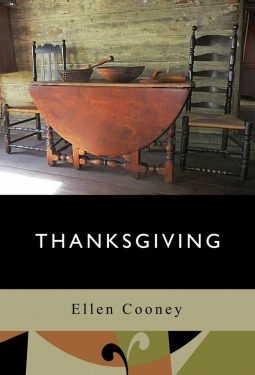 In Thanksgiving, we follow the Morleys through 350 years as they prepare a holiday dinner in the kitchen of their family home. We see the love of newlyweds, mothers handing down traditions, children worrying about their parents, and the ways that family changes and sustains us. This book has wonderful insight into the ways that families react when they add new members. Mothers grieve the relationship they used to have with their sons and worry that their traditions will not be carried to future generations. New wives fear that they will never feel comfortable in this family with so much history and wonder how to integrate their habits into everyday life. The author has picked a wonderful lens to view a changing family through - what is more sacred than our holiday traditions? Cooney does a great job of establishing time period while rarely leaving the family home. While there is a date at the beginning of each chapter, you really feel that you are looking in on a family living hundreds of years ago. Historical events are referenced, but the book is more about the differences in day to day life as opposed to a reaction to specific moments.The differences in the ways people worked, ate, and lived with each other sit in wonderful tension with the strength of familial love - something that never changes. This is not a book you want to space out. It can be confusing if you put the story away for a day or two and then try to figure out how the people in the next sections are related to the ones in the previous parts. This is a book you want to read in a giant burst, as you watch characters grow older and see the family grow and change. Thanksgiving is a perfect fall read. It feels like a window back into time, like you are sitting in a warm kitchen on a snowy day with a cup of tea while watching the day to day life of a family you know and love. This is a wonderful read with lovely prose and fascinating characters. Best of all, reading about the Morley family will make you more thankful for your own - and isn't that the point of Thanksgiving? I don't typically pick holiday reads. This one is an exception for good reasons!